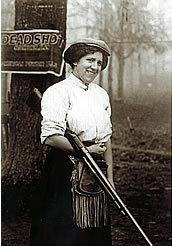 During the early years of the 20th century, a woman born in Germany was the best lady shooter in America. In the hay days of baseball's, "Ty Cobb" and horse racing's "Man O War", folks came to watch her shoot cigarettes from her husbands mouth with a handgun or perform other amazing acts of marksmanship. Back when men wore knickers with brightly colored stockings and it was illegal to shoot on Sundays, thousands came on Saturdays to see her perform. Annie Oakley's shooting stories have been told countless times through books, movies and Broadway but this red headed woman was head and shoulders better. History will never forget Annie Oakley nor will they likely remember Elizabeth Servaty later known as Plinky Topperwein. She was the first woman ever to be allowed to shoot in the Grand American, the first woman to break 100 straight and the first lady to break 200. Her story, marriage, and some 40 years of professional shooting for Winchester is as romantic and interesting as anything Hollywood has ever produced. When he was 11 years old in 1880 Ad Topperwein of San Antonio Texas watched Doc Carver shoot aerial targets with a rifle. The six foot four inch Carver weighed some 200 pounds and long red hair fell in well combed ringlets over massive shoulders. Historians often referred to him as the most handsome man who ever held a gun. Carver initiated aerial targets using a rifle and at one time held most of the endurance and accuracy records for hand thrown rifle targets. After watching him perform, young Ad Topperwein knew what he wanted to do the rest of his life He wanted to do what Carver did. By the time he was 16 he could duplicate everything Carver did. He had no coaching and learned by constant practicing even originating shots no one had done before. To supplement his income as a cartoonist for a local newspaper he began performing trick shooting exhibitions around San Antonio. George Walker an opera house and vaudeville manager from San Antonio saw Ad Shoot and was impressed. During the days before motion pictures, vaudeville troupes kept America entertained. Trained dogs, leaping frogs, talking cats, and ventriloquists kept folks laughing. Walker convinced Topperwein that a shooting act would be very different and popular He went to New York every summer to book attractions for the coming season and in 1898 convinced Ad to go with him and he'd put him in the vaudeville business. Gentleman, Jim Corbett, was the heavyweight boxing champion of the world and he was a friend of Walker's. The champion owned a resort on 42nd Street, and here, Adolph Topperwein was introduced to theatrical agents, sports writers and professional people. "The Texas Triggerman", as Walker called him, was the best shot the world has ever seen. His exaggeration of Ad's skill embarrassed the modest Texan. A reporter from the New York World suggested they go to Coney Island where Mr. Topperwein could show what he could do with the rifle. During that time Coney Island had many shooting galleries. Targets consisted of small plaster birds, stars and pipes of clay. In the center was a three quarter inch bulls eye about 30 feet away with a sign that said, "you get a ten cent cigar every time you ring me." Topperwein picked up a Winchester Model 1890 . 22 caliber rifle and preceded to ring the bell consistently. The gallery operator began giving him cigars which were of no use to him as he didn't smoke so he gave them to the crowd and reporters who were watching his performance. By now, all the others had quit shooting, and were watching Ad break the clay pipes and plaster birds. The crowd whooped and hollered as Topperwein finished breaking the last object in the gallery. When it came time to settle up with the operator the poor fellow was so excited and confused he had forgotten to keep track of the number of shots. Mr. Walker gave him $5 and they went on to the next gallery with the crowd and reporters following. Here Ad did the same thing destroying everything in sight. But, this operator kept track of the shots and it cost Mr. Walker $8 and change. The next morning in the New York World there was a four column story about "The boy from Texas who put shooting galleries out of business at Coney Island" It was all he needed to break into vaudeville and was hired by the Keith Circuit for $70 a week. There were other shooting acts in vaudeville during those days but Topperwein's show was different and unique. One day when he was at a railroad station, he noticed the backs of the benches were perforated with holes forming the Texas Star and the name of the railroad. The holes suggested bullet holes to him. Having an artistic temperament, he began shooting five cornered stars, circles, triangles, and his initials with a .22 caliber rifle. He'd set up a piece of blank paper at about 25 feet and sitting on the ground sketch nearly any picture he wanted with bullet holes. One day he shot a picture of an Indian head and this is what separated him from other vaudeville shooting acts. No one could sketch an Indian with a lead pencil let alone shoot one with bullet holes. He shot three times a day, six days a week. The audience loved those Indian heads. After two years, Orrin Brothers Circus of Mexico saw one of his acts and offered him one hundred pesos a week with expenses. They were referred to as "The Ringling Bros of Mexico", they were well financed and owned their own auditorium in Mexico City. He joined them in April of 1900 for a nine-month engagement. When he returned to the United States on the last day of Dec, 1900 there was a letter waiting for him from the Winchester Repeating Arms Co. Several years before he had made the acquaintance of Jim Hildreth, Winchester's representative in the southern states. Hildreth knew what Topperwein could do with guns and the fact that he preferred Winchester firearms and ammunition. The letter said they would like to talk to him in New Haven, CT. He arrived at the Winchester plant in January of 1901. He had never seen snow before and there was some three feet of it in New Haven. Very enthusiastically, he met with Mr. Bennett, the president, who offered him a job to take charge of their exhibit at the Pan American Exhibition in Buffalo, which started in April. It seems that John Cameron their representative at Buffalo would not be able to attend the exhibit all the time and when he wasn't there, Ad was in charge. Topperwein was extremely disappointed. For sure, it was a foot in the door, but not what he expected. He wanted to shoot and there was to be no shooting at the exhibit. While in New Haven he was given a free run of the factory. He could go where he wanted, ask questions about the product and learn how to take guns apart and put them back together. Nights back in his hotel he studied the company catalog until he could recite what was on every page. One day as he was going through the pistol loading room he stopped in front of a machine that loaded cartridges so quickly it fascinated him. He stood watching it for some time and didn't notice the operator. When he did he looked right into a pair of laughing brown eyes. The young woman called him by name and he quickly withdrew. He went over to the foreman he knew pretty well and said he'd like to meet that girl But, it was against company rules to talk to operators. Ad insisted and the foreman led him back to the young woman. The foreman said, "Now don't talk to this girl - this is Mr. Topperwein, this is Miss Elizabeth Servaty, now come, let's go!" Ad didn't know it at the time but he had just met his future wife. When finished at New Haven he went to the exhibition at Buffalo. Mr. Cameron would visit once a week to check up on things but the Winchester exhibit was Topperwein's responsibility. He remembered the day President William McKinley was assassinated and heard the shot that killed McKinley. Ad stayed in Buffalo for six months until the exhibition closed It was the only time in his life that he didn't shoot for six months. He said, "I didn't fire a shot. There was no shooting there, just an exhibition of guns. It was very hard on me, in fact it was awful." While in Buffalo, he was in constant correspondence with Elizabeth. When he came back to New Haven he saw her again, met her people and went back home to Texas as an exhibition shooter for Winchester. The job he had always wanted. In January of 1903 he went back to New Haven and married Elizabeth on January eleventh. She had never been out of New Haven and things in San Antonio were strange and new to her. His folks took a liking to his new wife and they lived with his mother and sister. Shortly after settling down Elizabeth expressed her interest in shooting. She didn't want to stay home while Ad was away giving shooting exhibitions. He started her with a little 22 and was amazed on how quickly she mastered things. The most trouble he had was with the awkward way new shooters hold a gun. It took sometime to get the right poise and foot position but after she mastered it things commenced to go easy. He started her by letting her shoot a bullet hole into a blank piece of paper at about thirty feet. She would then shoot ten shots at this bullet hole to see how small a group she could make. All of this was offhand shooting. Her first groups were large but gradually they became smaller and smaller and soon all of them could be covered with a nickel. About a month after she began this kind of practice she started shooting chalk and crayons out of his hands and lips much to the horror of his mother and sister. It was a dangerous stunt but Ad knew she could hold that rifle steady as a rock. After she accomplished her skill at stationary targets he started her on aerial shooting, beginning with large tin cans then smaller and smaller ones. The sound of the bullet hitting tin cans made what she described as "plinking". As the aerial practice continued, she began referring to it as Plinking. Ad picked up on this and started calling her "Plinky". The name became synonymous with her and for the remainder of her life she was known as Plinky Topperwein. Eventually the word was so commonly used in rifle shooting that it was listed in Webster's dictionary. During the time Ad was on the road, sometimes for up to two months, Plinky would practice shooting everyday on a shooting range in their backyard. When he returned she would have many targets to show him and tales of success and failures. She started her shotgun shooting with a little 20 gauge gun at St. Louis during the World's Fair. Alec Mermond was operating the DuPont Shooting Club and persuaded her to shoot a hundred targets with a gun that didn't fit her. She broke 83 of the first hundred she ever shot at. When traveling in Texas Ad took her with him and paid her expenses. And, this kept the Topperwein family broke most of the time. She was not employed by Winchester and Ad often entered her in Trapshooting events as an amateur, shooting for targets only. This got expensive and for a while she stopped. At the World's Fair in 1904 that she established her first world record for aerial targets by a woman. Using the new Winchester Model 03 .22 caliber auto loading rifle she broke 967 of 1,000 clay disks thrown into the air at 25 feet from where she stood. It took her one hour and thirty minutes to accomplish the feat. Ad paid for all her expenses during the six months they were at the World's Fair. They didn't want to be apart for so long a time and although they couldn't afford it he took her along. 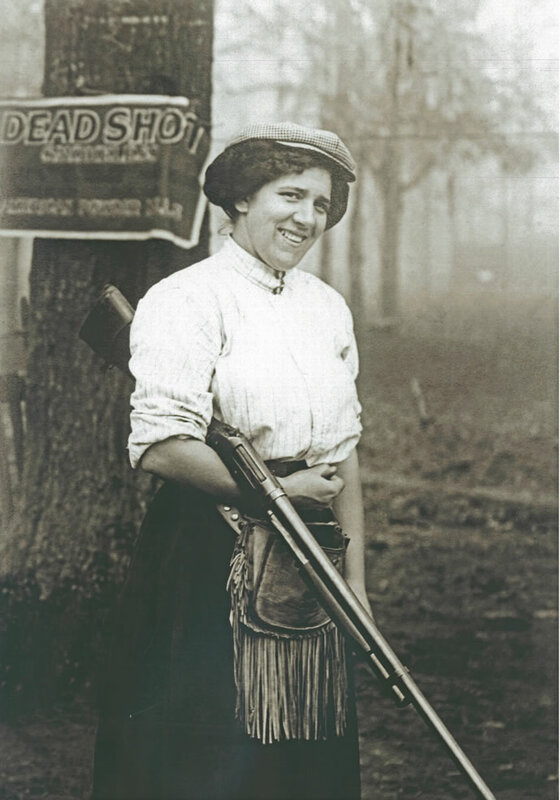 As a result of her record shooting at St. Louis and other cities where she performed with Ad, Winchester made and arrangement with the Dead Shot Powder Company for Plinky to shoot their powder at the traps which made her a professional. This certainly helped financially and she now accompanied Ad on all his tours. For 42 years they traveled the entire United States, Canada, and Mexico giving exhibitions of aerial rifle shooting and trapshooting. The arrangements with the Dead Shot Powder Co. were changed and she was made an employee of Winchester to shoot exhibitions with Ad. She called him "Daddy" and he referred to her as "his current wife", but it was the only one he ever had. There might have been women who were better with a rifle than Plinky, or a pistol but there were none who could shoot a rifle, pistol, and shotgun better. She cold handle all three like no other woman ever could. When shooting buttons off his chest or cigarettes from his mouth with a handgun, she always kissed him first. Days when dangerous shots were to be performed and she didn't feel up to it she'd say, "Daddy, lets not do this act today." He never asked her why but for almost 50 years there was never an accident. The first trophy Plinky ever won in open trapshooting competition was at Elliott's shooting park in Kansas City on Feb. 4, 1906. It was very cold and there was some six inches of snow on the ground but she broke 99x100 to beat the field and win the Ed O'Brien Trophy (Ed O'Brien was a Remington professional at the time). The next day's program called for a fifty bird live bird contest. The entry fee was high and the top pigeon shooters in the country were there. Plinky had never seen a live-bird shoot let alone shoot a live bird. Ad was reluctant putting up the rather large entry fee of $20 but Plinky wanted to shoot. Uncle Bob Elliott who owned the park told Ad he'd furnish the birds free if Plinky could shoot. So, that settled it. She killed the first seven pigeons before they got far in the air. The eighth was a snow white in-comer and it fell six feet from where she stood. The bird fluttered before it died and stained the snow red with blood. She walked off the line and all the coaxing in the world would not make her continue. Throughout the rest of her life, she never shot a live bird of any kind again. At some gun clubs they attended Plinky would shoot 100 targets against four of the best shots the club had. Each man would shoot 25 targets and Plinky would shoot 100. She would shoot against one man at a time 25 targets each. The total of the four would be counted against her score of 100. She won nearly every match shot under these conditions. At one club, the four men were exceptionally good. The first broke 24, the next 25, the next 25, and the last 23 for a total of 96x100. Plinky broke 99 missing her 91st target. Besides her shooting ability Plinky had other accomplishments. She was an excellent cook. When the Topperwein's were in hotels away from home and received a good meal she'd ask the waiter if she could talk to the cook and learn how to prepare that particular dish. Plinky was also very clever working with a needle. It took her 10 years to finish a twelve-foot by six-foot table cloth of white Irish linen. On it, she embroidered the names of all towns in which they shot in the many years of touring the country. She carried it with here on the road and would work on it nights at hotels. Ad would sketch the name of the town in pencil and she would embroider around it. Mrs. Topp, as she was referred to by many, also had an excellent singing voice but she did not play an instrument. Among her many trapshooter admirers was John Phillip Sousa, the famous band leader. While attending a trapshoot in Mississippi the crowds were large and the accommodations small. Private families took shooters into their homes for lodging This was a common practice in those days. The folks who took in the Topperwein's also had John Phillip Sousa as a guest. After a party someone suggested Sousa play a selection on the piano. He refused saying he didn't feel like it. When Plinky asked him to play he agreed but only if she would sing. They picked out one of Plinky's favorites. He played and she sang. When they got through he put both hands on her shoulders and said she could sing as well as she could shoot and anytime she got tired of shooting let him know and he'll put her on the road with his band. Their shooting days were fast and grueling. They performed each day and traveled by rail every night to the next city. This went on week after week with scarcely a day to rest. If it rained, they shot anyway In many western and southern towns they coming of the Topperwein's was proclaimed a holiday. Shops, stores, and schools were closed. Sometimes in a town of two or three thousand, as surrounding villages made it a holiday, would have an audience of three to four thousand. On southern church took advantage of their shooting by having an auction after the exhibition. Ladies of the church picked up all the targets they had shot at, tin cans, wooden blocks, bits of metal disk, cartridge casings, and shot shell hulls. The wooden blocks sometimes brought a quarter because they had a bullet hole in them, the shell that had been shot from Ad's fingers brought forty to fifty cents. Folds paid ten to fifteen cents for old tin cans shot full of holes. Ad's Indian head went off the auction block for $10.00 (two sold on E-Bay recently for $2,00.00). The church collected more money at the auction then the Sunday morning offering plate had received in over a month. Plinky's trapshooting was practically all in competition. Both registered and unregistered targets were shot under all kinds of weather conditions. If she wasn't competing against local hotshots she was shooting against the best professionals in the country. Her favorite position in a squad was post #1. Shooting against the clock was popular in those days and records were kept on how long it took to break a certain number of targets. Big bets were made by the large audiences who always witnessed those events. Shooting alone on June 1, 1906 at San Antonio she broke 485x500 16 yard targets in two hours and 25 minutes (about 25 targets every nine minutes). In 1908 she tried to beat the record of John W. Garrett of Colorado Springs who once broke 961 x 1000 in four hours and 35 minutes. Ad tried to talk her out of these endurance contests as they were extremely fatiguing. Shooting a 7 lb. Model 97 Winchester trap gun for over three straight hours was more than most men could handle. But, here German stubbornness prevailed and on Nov. 11, 1916 at Montgomery, Ala. She shot at 2,000 16 yard targets breaking 1, 952 in 5 hours and 20 minutes. Her average of 97.6 % established a new record. Actual shooting time was three hours fifteen minutes (25 targets shot at in less than 5 minutes) but time was lost unpacking targets and repairing the trap after only 300 birds. Her longest run was 280 straight. A large crowd was present and lots of money changed hands among the spectators. One unbelieving soul bet $100.00 that she would never shoot 2,000 shots and then to cover himself he bet another $100.00 that her score in the second 1,000 would be less than her first 1,000. He lost both bets as her score in the second 1,000 was two better than the first. At the time, this was the most number of trap targets shot at and broken by either man or woman in a single day. It might still be a woman's record. She used one Model 97 Winchester trap gun, which was cooled off after every 25 shots by dipping it in water. Plinky would never shoot with a coat no matter what the weather. Neither would she wear a glove. A blister formed on the palm of here left hand during the marathon shoot. After 1,000 shots, her entire palm was a solid blister and it broke open. The shooting stopped and a doctor bandaged the hand. After a half dozen shots she tore off the bandage because she said it worried here, the balance of here shooting was done with her hand raw and bleeding When she finished the doctor again treated her. It was three weeks before she could remove the bandage and begin shooting again. When on tour through east Texas the Topperwein's stopped at a little town around noon time. It was a relatively small community but Winchester wanted them to put on an exhibition anyway. The town was crowded with people, horses, buggies and wagons as people from the surrounding countryside were attending a murder trial. While eating lunch at the only hotel the judge and prosecuting attorney were introduced to them. They inquired what time they were going to shoot. It seems the trial would not be over before the exhibition began. They were scheduled to leave on the 5 p.m. train to shoot at the next town the following day and it would be impossible to delay the exhibition until the trial was over. The judge returned to the court house after lunch rapped on the bench with his gavel and told the crowd that due to matters of which he had just learned it will be necessary to adjourn until ten o'clock tomorrow. Attorneys for the defense, the prosecutor, the jury, witnesses and spectators all moved to the shooting grounds where they enjoyed the exhibition. They shot on a baseball diamond directly behind the town jail. While the Topperwein's were shooting the defendant in the murder case together with several other prisoners watched the show from the barred windows of their cells on the second floor. This could only happen in Texas! And, the result of the jury's verdict is unknown. The Liggett Company once asked the Topperwein's to perform at a large druggists convention near Boston. Over two thousand Rexall druggists were present. Mr. Liggett was well acquainted with Winchester officials from the home office. He was also a personal friend of Calvin Coolidge who was the President of the United States at the time. So, he invited Calvin and Mrs. Coolidge to watch the show. Ad was told to hold up the exhibition until the Presidential yacht arrived which was to be announced by a cannon shot. The weather looked bad. Heavy clouds and wind predicted a storm was soon to break. Ad and Plinky were anxious to start before the weather set in and had about given up that the presidential party would attend But, the President and Mrs. Coolidge did arrive and took from row seats. The Topperwein's went through their regular shooting routines but every time they glanced over at the President he looked like a stone statue and quite bored. But, Mrs. Coolidge was over enthusiastic and applauded everything they did. It seemed that nothing they did could arouse old Calvin's interest. At one time, they thought he was asleep. The show reached a point where Ad used the shotgun and eggs for targets. He would throw up 2, 3, 4, and then 5 breaking them all before they hit the ground. As a climax, he laid his gun on the ground, threw up an egg, ran fifty feet to the gun, picked it up and broke the egg before it hit the ground. Only then, did Calvin show any interest, he applauded. After the exhibition, the Topperwein's were introduced to Mrs. Coolidge and the President. She was very pleased with the show saying it was the most wonderful thing she had ever seen. But, the President was less than enthused. After complimenting them on their shooting he told Ad it seemed to be a terrible waste of eggs! In all the years of traveling the country doing just about the some type of shooting at many of the same places Annie Oakley and Plinky met but a single time. The Topperwein's were booked at a hotel resort in Portsmouth, New Hampshire called Wentworth-By-The Sea (it's still there but now a Marriott). Annie Oakley and her manager/husband Frank Butler had been there for sometime giving trapshooting instructions to ladies staying at the hotel. Their contract expires a week before Ad and Plinky were scheduled to perform but when they heard the Topperwein's were coming they stayed an extra week to watch them. It was raining during the day of the exhibition but the grounds were filled to capacity. As was their usual routine. Plinky first shot 100 targets at the 16 yard line in a squad with the best local performers that could be found. She broke 96 which Ad considered excellent und the conditions. By the time the trick shooting started it was really pouring. Both Topperwein's were in top form that day and scarcely missed a shot. Annie and her husband watched the complete show. Right after the final shot Annie ran over to Plinky and said, Mrs. Topperwein, you're wet, your clothing is all soaked. I want you to come up to my room and I will fix you a cup of tea and I want to talk to you." Ad's memoirs said Plinky was in Annie's room an hour or two. When she returned she told her husband that Annie told her she was the greatest shot she had ever seen and how she wished she was younger so the two could team up. Frank (Annie's husband) had told her about her shooting but she saw things today that she never imagined could be done. "I didn't think it possible for any woman to do shooting like you did!" And, Annie Oakley cried. In all the years that followed Plinky and Annie corresponded through post cards and Christmas greetings but that was to be the only time they were ever together. One of Ad's favorite Plinky stories happened in one of New Haven, CT's best hotels. They arrived late and had little choice of rooms. About two in the morning Plinky woke up screaming there was a rat in their bed. Ad tried to convince her she was dreaming but about ten minutes later he realized she was right. He jumped out of bed and turned on the light in time to see Mr. Rat scurry along the wall to an opening in the floor made for a gas pipe. When they demanded another room the night clerk informed them there were no rats in the hotel and there were no more rooms. The hotel was filled. The morning after all this, a chambermaid told them there were vacant rooms on their floor. The clerk was just too lazy to move them. The next morning the hotel proprietor was behind the desk. He was red faced with anger over the previous nights shooting and threatened the Topperwein's with arrest. Ad told him to do what he had to do to them reminded him he was an employee of Winchester and the morning reporter for the local paper was a friend of his. Topperwein assured the proprietor that folks around New Haven would find a newspaper story about rats in his hotel quite amusing. There was an immediate change in attitude and a half hearted apology. He changed their room to a first floor suite and couldn't do enough for them during the rest of the time they stayed there. During World War II Plinky and Ad performed exhibitions in front of hundreds of thousands of soldiers at basic training camps through out America. Ad was now in his seventies and Plinky eleven years his junior He could still stand on his head and break clay targets in the air or do three somersaults and hit hand thrown wooden blocks with a rifle. But, the strain of some 40 years of hectic travel caught up with Plinky. In early January, 1945, she suffered a heart attack and on the 20th day of the month, died. The world's greatest woman shooter isn't with us anymore. She passed away quietly in San Antonio, her only regret that she would be parted temporarily from her beloved "Daddy". Perhaps people may forget that Mrs. Topperwein once broke 367 clay targets in a row; that she broke 200 straight 14 ties and 100 straight on more than 200 occasions. But, not a living soul who knew "Plinky" will ever forget her great warm heart, which she wore openly on her sleeve in adoration of her accomplished husband. And, nobody will forget her ready wit and her firm handclasp, and her cheerful voice, and the way her eyes crinkled in the ever recurring smile. Ad took Plinky's untimely passing extremely hard. To make matters worse, he began to have trouble seeing well shortly after her death. Doctors predicted the glaucoma would eventually cause blindness. Years of shooting also affected his hearing but he continued to keep an upbeat attitude. Ad was active with the shooting fraternity for 17 years after Plinky's death. He taught shooting to youngsters even though he was virtually blind. Big time gun writers of his day often came to visit and he'd tell them about the old days on the road for Winchester. He walked three miles a day until he was 92 years old. The end finally came on March 4, 1962 and with it ended an era in America that most of us can only visualize. Many of us missed out on lots of exciting things by, unfortunately, being born too late. Ad and Plinky are prime examples. Their likes will never be seen again. published in: 2006 TRAP & FIELD, Volume 183, Number 11 & 12.